This is a pre-school learning and play program for 4- to 7-year-old children. It consists of 2 CDs. A CD Basic Program - ADDY Juniors Magic Garden, and a CD Tutorial - The Land of Knowledge. 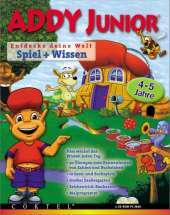 From the CD base program, you access ADDY Juniors Magic Garden, a land of fantasy with animated graphics and game activities. The CD learning program opens the door to the land of knowledge, which is constantly expanding within the ADDY Junior series. It's a bright, humorous alien who accompanies your child through the land of fantasy and various activities.